The City of Hamilton has halted the installation of new bike lanes on Herkimer and Charlton Streets after the Durand Neighbourhood Association (DNA) wrote a letter highlighting concerns with how they will be implemented. 1. The bike lanes are unprotected and vulnerable to "dooring" because they are between parked cars and the vehicle lane. As suggested by many people this could be fixed by moving the bike lane to the curb lane, protected by parked cars. 2. The lack of bike boxes for left turns at intersections, as have been installed on Hunter Street and Cannon. This makes it quite dangerous for cyclists to turn left as they have to unexpectedly veer out of the cycle lane across several lanes of traffic. 3. The fact the lanes are not continuous between James and Dundurn. There is a problem with turning left from Herkimer to James since the lane ends at MacNab. 4. The dangerous conditions at the Herkimer/Queen intersection. The need to re-design this intersection as a normal signalized intersection has been highlighted many times, also in the context of pedestrian safety. These issues were first raised in an investigation by local resident Kyle Slote, who wrote about the issues in an RTH article and in correspondence with the city and the DNA. Councillor Farr followed up with staff, noting that he had not received advanced notice about the planned bike lane installations and writing, "May I respectfully request that we honour the good working relationship with the Neighbourhood Association and hold off on any implementation until such time that everyone can sit down a engage? I am sure we can work this through together." In response, senior staff in the Public Works Department agreed to hold off on further work until after staff meet with the Ward 1 and 2 Councillors, representatives of the Kirkendall and Durand neighbourhood associations to discuss how best to resolve the safety issues. Way to go Janice Brown, Kyle Slote and Councillor Farr. Everyone involved wants a bike lane that works, but there's a lot of risk associated with doing it wrong. Farr's quote is such a good example of political teambuilding! My only fear is that the lanes are delayed indefinitely. This is awesome news, great job from everyone for getting this implementation re-evaluated. As I've been riding down there this week and thinking about it, to me it seems to really make the most sense to have the bike lane on the north curb lane. The majority of people taking Herkimer are likely going to be turning left to head down towards downtown. Having the lane there to avoid having to go across two lanes of traffic would be great. I know we can use bike boxes for that if it's in the south lane, but you still need to stop and wait at the light in that case in order to get over. Wow. This is unexpected great news. Whoever has this level of pull to get this project re-evaluated will hopefully advocate very strongly for the inclusion of bike boxes, the extension of these bike lanes to Dundurn and for the simple shuffling of lanes so the bikes are protected by parking instead of being sandwiched between parking and live lanes. There is zero extra cost to this change in design, it's simply putting the bikes beside the curb, instead of parking. The rest is still all paint. Wherever there are concrete bumpouts (Herkimer and I think Hess?? ), simply end the street parking one car length before the bumpout and have the bike lanes swing around the bumpout and back against the sidewalk. The only extra cost is for bike boxes, and this is minimal. The bike lane being on the north side of Charlton makes sense to me, especially since one long stretch runs adjacent to the HAAA grounds where no street parking would be allowed. I would suggest knockdown sticks perhaps along a stretch like this with no parking protection. Herkimer I see the merits of having the lanes on either the north or south curb lane. North curb would make life easier crossing Queen and remove one lane of car traffic from zipping next to Durand Park, as well as making life easier for left turns onto James. However, the south curb makes life easier crossing Bay and would be parking-protected the entire length. Again, a bike box at James is ultra important. There's simply no need for 3 turning lanes at a dead-end street. 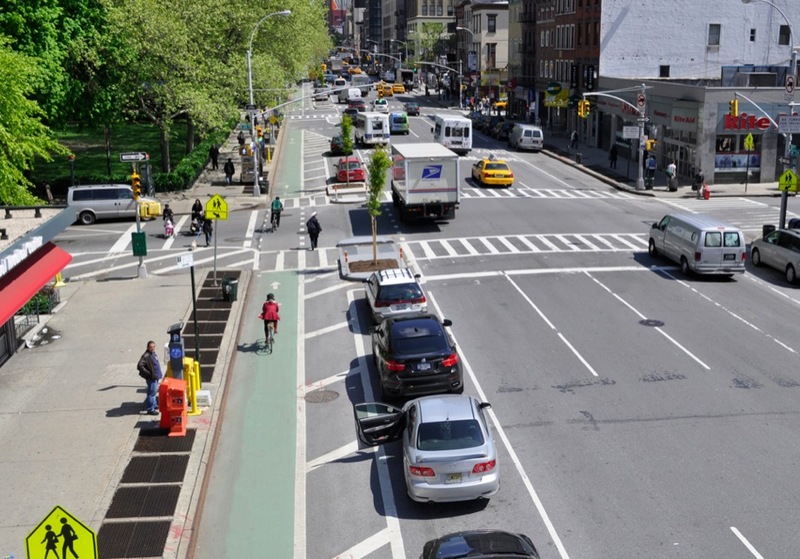 NYC just launched to the top of US cycling cities by using parking-protected bike lanes. Montreal has been doing it for decades. Much easier than building entire new curbs or rows of planters. Just requires paint and perhaps some knockdown sticks at the start/end of blocks. This is a great first step! Thank you to the DNA and councillor Farr for taking such swift action. Here's hoping we can now work together to an effective solution! What a shame that the Hunter Street lanes wern't being installed closer to the election date, so they could have been put on hold and redesigned properly. Sandwiching a bike lane between parked cars and the sidewalk is actually quite dangerous for pedestrians and cyclists. Right hooks become more likely as right turning drivers can't see what's between the row of parked cars. And if you think doorings, pedestrian wanderings, and complete obliteration in winter are bad in normal bike lanes, passenger side is much worse. Poor research by the DNA. experience in Montreal, NYC, Copenhagen to name a few of the leaders in the cycling world, say otherwise. The extra distance between the bikes and turning cars gives everyone that much more space to see each other. 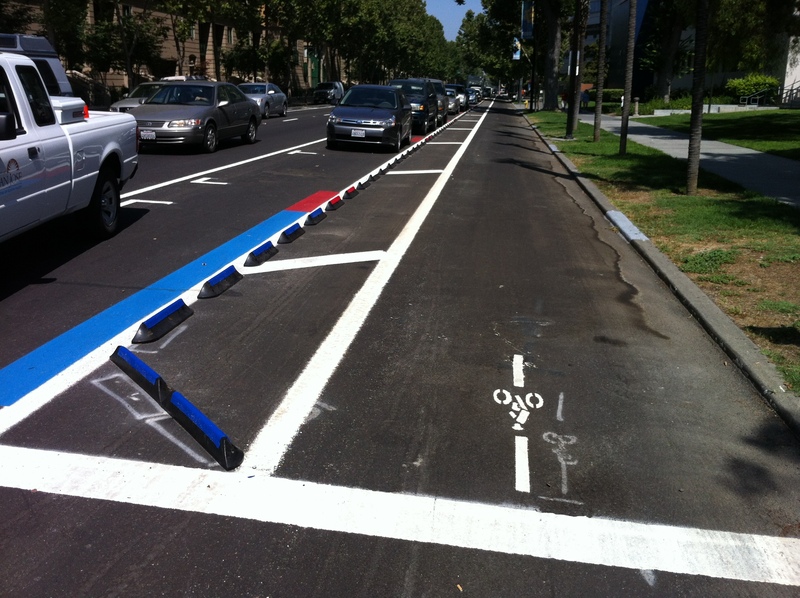 A 2-3 foot buffer zone is painted between the parked cars and bike lanes to eliminate dooring. NY's protected bike lanes are one of the main reasons they were ranked #1 in American in 2014 for cycling. This is a tried and true bike lane design that is used in the cities leading the pack in attracting the coveted 65% of 'interested but nervous' potential cyclists. I am a huge supporter of bike infrastructure but I can't help but think that bike lanes in ANY configuration are not the solution these streets need. Better to invest the time and money in proper redesign of trouble intersections than just painting a one-direction bike lane along both streets. I would agree with you except that this approach has already been tried and has failed. Council was not interested in talking about more one-way conversions, just as they and city staff have not been interested in implementing the conversions that have already been approved. in the absence of that happening anytime soon, these bike plans are a good step forward as it reduces live traffic lanes to 1 for most of the day, and on Charlton there is only 1 lane 24-7 from James to Hess. Having lived in Portland and spent much time in Montreal, I like to remind people that one-ways aren't bad. Hamilton's freeway style one-ways are bad. Portland is rife with 1-ways. Far more than us. Ditto for Montreal. 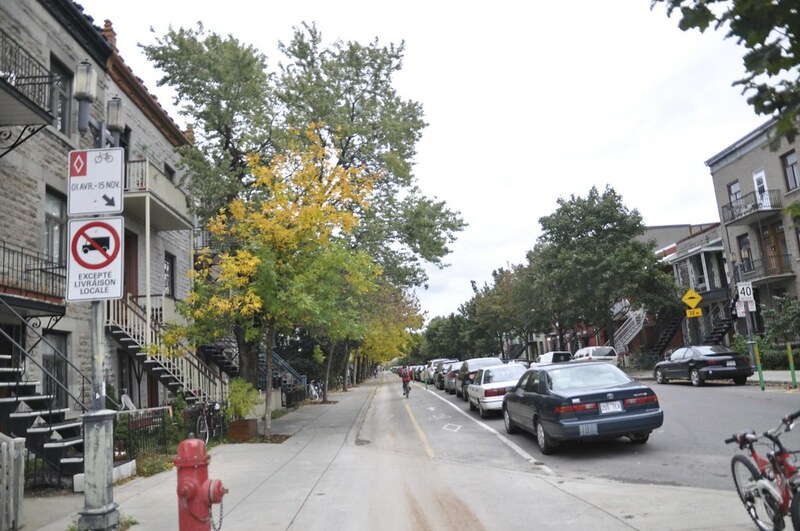 Montreal uses the space for this exact cross-section - bike lanes beside the sidewalk, parking and 1 traffic lane. These streets are quite rideable as is. Certainly better than other one-way car sewers. Get rid of the freeway on-ramps on Herkimer and calm Charlton to start. this is true of the downtown as a whole. But don't confuse Hamilton city hall with folks in TO or Amsterdam who actually value quality of life, safe streets and a strong economy as something worth pursuing. Ok, cars have doors on the right side as well. So with this configuration a cyclists only option will be to brake in the event of a door opening. Also, I live on Herkimer and park on the right side. Now i'll be parking a metre (and a half?) out into the street? Will the DNA cover the costs of my car getting sideswiped? Or hospital fees for me getting smunched trying to get in the driver side? I'd much prefer a traffic calming solution kind of like they have implemented along Aberdeen east of Queen. Cars have doors on the right side as well, but they are rarely used. 85-90% of car trips are with one person. A small buffer area is typically painted between the bike lane and car parking lane to avoid 'dooring'. And opening your car door on the traffic side would be the same as it is now, and on all streets. You would look in your mirror before swinging open to be sure cars aren't right there. The extra space for bike lanes will be accommodated by repainting the street so the parking lane is a proper parking lane, instead of a full traffic lane width, as well as by narrowing the car lanes, which throughout Hamilton are usually wider than necessary. So you won't be parked 'out in the street'. You'll be parked in a clearly marked parking lane as shown above, but with a bike lane between you and the sidewalk. More images from Montreal, Copenhagen and Paris. This is a common design used around the world, and is one of the reasons Montreal and Copenhagen are world cycling leaders. Parking-protected bike lanes like this are one of the reasons Cycling Mag ranked NYC #1 in America this year. Ya, what I see in the pic from NYC is just not happening on Herkimer. That bike lane and the parking itself is about 80% of the width of the road. All that would be left is enough room for another bike lane! don't worry about space comparisons. That's a major 5-lane thoroughfare in Manhattan. Only point of that pic was to show that visibility at corners is absolutely fine. The way the streets had already been painted was pretty much using the same amount of space, just with the bike lane between parking and the traffic lane. Herkimer residents and the DNA should be pushing HARD for traffic lanes no wider than 9 or 9.5 feet. The 10+ lanes that were dotted are not necessary. They encourage speeding and waste road space. Which should make you happy if you live on Herkimer. How can I get involved in this discussion? I am not particularly happy about the implementation of the Hunter Street bike lanes and I'd like to see a better consideration and analysis for safety and vehicle commuters. I'm all for bike lanes but not if it disables the flow of vehicle traffic and puts cyclist in harms way. I'm looking to get involved as well. I'm going to start by going to the next meeting of the Hamilton Cycling Committee. They meet once a month on the first Wednesday of each month usually. The next meeting is on Wednesday November 5th starting at 5:30pm at City Hall. It sounds like staff from the city who are involved in cycling are there to discuss cycling matters with the committee and citizens. By the sounds of your concerns you probably don't need to get involved. Everyone who works at city hall has vehicle commuters and flow of traffic as their #1 priority. That's why Hunter is still a freeway past central school, city hall and GO. Seriously? Is that what you think? Every single person at City Hall commutes by car and doesn't care about the city? It's that kind of nonsense that makes people not believe you, or take what you have to say seriously. You may be jaded and burned out from fighting what you think is the good fight, but you come across as juvenile and immature with those types of comments. Or worse still, you come off as a troll. Not sure if this is directed at me, but my comment was sincere. Not jaded or juvenile. Simply suggesting that the time and effort prob isn't necessary if someone is concerned about traffic flow. City hall most certainly has that as their number 1 priority. Not sure why that sounds offensive.